This is one of the best sites on Texas Bats. It has been set up by the Texas Parks & Wildlife Department working with Texas Tech University. 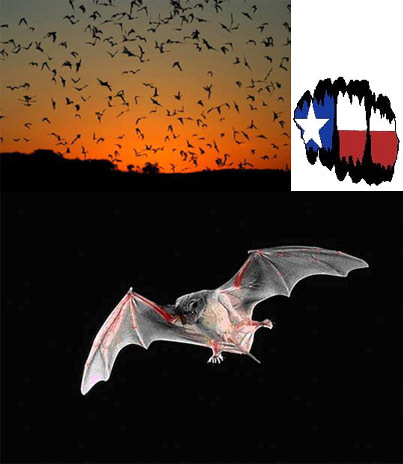 Texas is home to some of the largest Mexican free-tailed bat (Tadarida brasiliensis) colonies in North America. Many of these sites have become popular tourist destinations as the bats emerge in awe-inspiring numbers each summer. Below is a list of all the different places you can see bat emergences in Texas. Type: Non-maternity colony; half million Mexican free-tailed bats. Note: This site is located on the Caprock Canyons Trailway. Visitors can ride mountain bikes, hike or horseback to the Tunnel along the Trailway. This is about 10 miles round trip along the old railway. Hours of Operation: Open year-round; BCI interpreters available to answer questions in the summer on Thursdays through Sundays. Hours of Operation: Visitor's Center open 7 days a week from 10:00 am to 5:00 pm; Bat-viewing tours and presentations given Wednesdays thru Sundays from April to October by reservation. This article from the February 1931 Modern Mechanics magazine outlines the activities of Dr. Charles A. R. Cambell of San Antonio, Texas. Bats, Mosquitoes and Dollars discussing the importance of Texas bats. Bat bombs were tiny incendiary bombs attached to bats that were developed by the United States during World War II with the hope of attacking mainland Japan. Four biological factors gave promise to this plan. 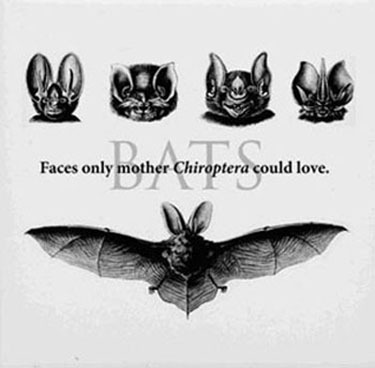 First, bats occur in large numbers (four caves in Texas are each occupied by several million bats). Second, bats can carry more than their own weight in flight (females carry their young — sometimes twins). 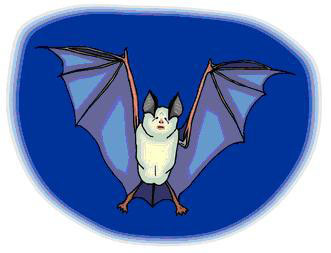 Third, bats hibernate, and while dormant they do not require food or complicated maintenance. Fourth, bats fly in darkness, and then find secretive places (such as flammable buildings) to hide during daylight. The plan was to release bomb-laden bats at night over Japanese industrial targets. The flying bats would disperse widely, then at dawn they would hide in buildings and shortly thereafter built-in timers would ignite the bombs, causing widespread fires and chaos. Dental surgeon Lytle S. Adams, who submitted it to the White House in January 1942, conceived the bat bomb idea. The plan was subsequently approved by President Roosevelt. 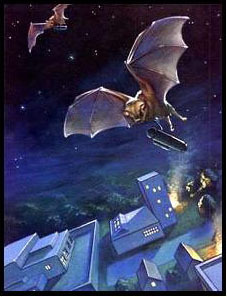 Adams was recruited to research and obtain a suitable supply of bats.